As every business owner knows, customer satisfaction is a major key to the success and growth of a business. Every business owner also knows that an unsatisfied customer base can mean the end of the business. From online stores to a local shop, using the right delivery receipt template can help prevent frustrating and avoidable errors that can have a powerfully negative effect on both the reputation of your business and yourself. 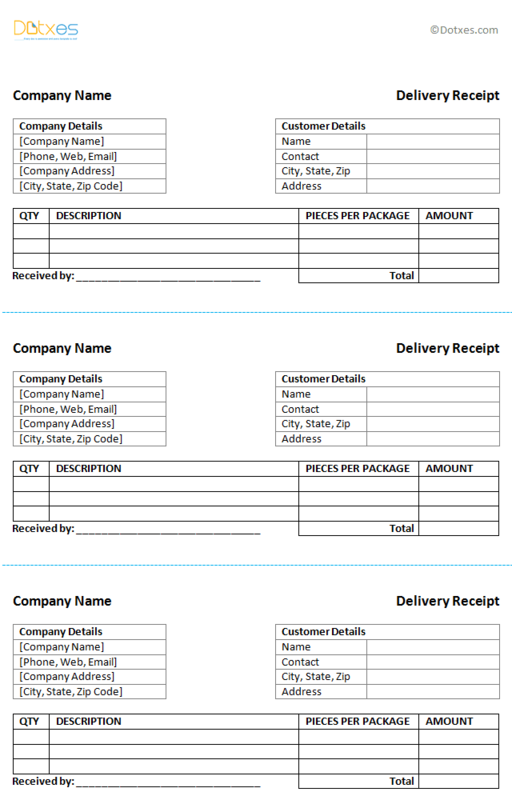 A good delivery receipt template should be simple and clearly understood, for both the staff and customers. Our free delivery receipt template does that. The layout is basic and effective, for both your business and your customers. The name of your business is clearly visible, with room for contact information to assist the customer in easily reaching your business. The customer’s information is conveniently placed as well, ensuring a smooth delivery while also making record keeping much easier for both the customer and business. The quantity and description of the delivered package, as well as the amount of items per box and prices, are prominently displayed on the delivery receipt template. This gives the recipient a clear view of what is being delivered, and is located directly above where the receiver’s signature is required. Arranging the information in this way gives the template a perfect, natural flow from top to bottom that can be read with ease. By using this delivery receipt template, you give your business a vital tool for deliveries and create an easy, straightforward delivery experience for your customers. Simple. Easy, fill-able format for me to use.